INDUSTRY.co.id - Jakarta - The efforts of PT Bank Rakyat Indonesia (Persero), Tbk to improve banking services to its customers continue. This time Bank BRI cooperated with PT. Siloam International Hospitals, Tbk (Siloam) in terms of providing banking services. This was marked by the signing of a Memorandum of Understanding (MoU) conducted between the Director of Institutional Relations of BRI Bank Sis Apik Wijayanto and the Vice President Director of Siloam Caroline Riady witnessed by the President Director of BRI Suprajarto and CEO of Lippo Group James Riady, regarding the provision and utilization of services and banking services, at BRI Head Office, Jakarta, Tuesday (09/18/2018). James Riady added, "Siloam is committed to continuing to expand its reach to serve as many patients as possible. We do this not only in urban areas, but also those in remote villages. The existence and readiness of BRI's network that is spread from western to eastern Indonesia will support us in realizing this. " Under the auspices of Lippo Group, there are currently 34 Siloam Hospitals spread throughout Indonesia. BRI and Siloam cooperation became an entry point to facilitate cashless payments to the community in obtaining health facilities at Siloam. The scope of the collaboration includes the provision of financial services in various ways. Among them is the use of Cash Management System (CMS) for Siloam management, the provision of both deposit and loan facilities, BRI EDC provision for payment transactions in all branches of Siloam Hospitals, as well as other banking services. 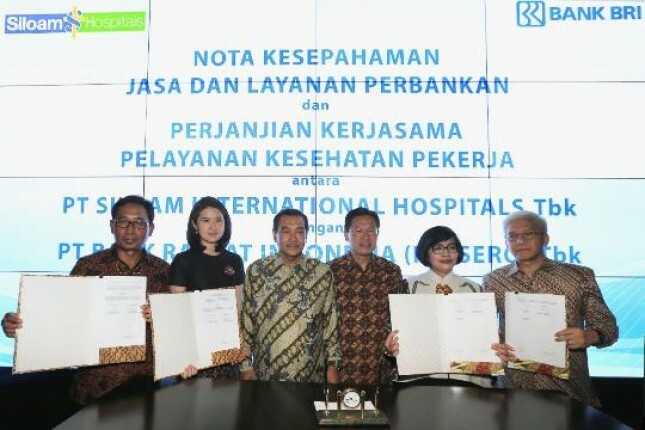 Suprajarto said that in addition to the MoU, there was the signing of a Cooperation Agreement (PKS) for BRI health workers. "This is done as a form of the company's concern for the health of workers. For the time being, the initial stage will be for BRI employees, however, it is not possible to have a special scheme for BRI customers, "Suprajarto added. The MCC includes the provision of special corporate tariffs, increased room classes for hospitalization, and 24-hour services for BRI employees and their families who experience health problems or need treatment. By showing the employee's identification card and / or guarantee letter from BRI, this service will cover any health problems experienced by workers and families of BRI employees.